Watching the weather forecasting models and then rearranging our personal schedules is what we do – if we want to enjoy a flight in good soaring conditions. On Sunday, Feb 21, I started a thread on our forum, Williams Today with the hopes of flying a post frontal flight in strong thermals on Thursday, 2/25, less than four days later. As the day came closer, the prospects for flying on Thursday fizzled, but it became apparent to me that the following day, Friday 2/26, would be a day for flying mountain wave along the west side of the Sacramento valley. Thus the title “2/26 A Wave day”. 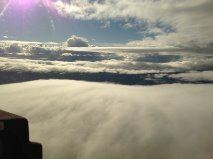 See the discussion on the forum, contributed by several pilots, leading up to this great flight. and the other thing is the Wave had no support below 5,000, since the air was unstable down low. It’s no wonder there was no secondary, etc. over Montgomery/ Indian. Or maybe, the convergence line was over optimistic on the 850 mb vv chart because the wind above it was increasing markedly, while the convergence in the BL below it couldn’t produce the convection due to lack of hot sunshine. Russ, Where were you at 1:24 I have photos of the entire time from 1:24 onward. Send me your trace and I’ll look for you in my photos. I suspect you crossed above me while I was towing out. The wave clouds were just starting to form about 1 PM. I looked through my films and couldn’t see you. I never saw you on my FLARM, and by the time I passed overhead Indian I was at 5,500 and you still don’t show up on my screen, so I suspect you were already back in the valley at 1.28- the time of this photo. As you can see there was good lift (85kts/ 300 to 500 fpm) over Indian but it was quickly followed by sink 2 0r 3 miles further west. Like I said we stayed below 5,700 ft for the next 5 miles after that. A bit tired after two flights. First one, very short flight, up to 3,000 no lift, then land and get a new tow. Flight log posted to OLC. The On Line Contest (OLC) posted this flight here. The OLC computations indicated the flight was 300 km at an average speed of 75 km per hour. 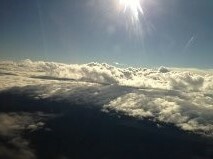 Not a record flight, by any means, but one of the unique opportunities to fly from Williams and take a nearly leisurely cruise at higher than normal altitudes over 150 miles. Lots of personal satisfaction in that. I have lots more photos, but I just need to find time to post them here.